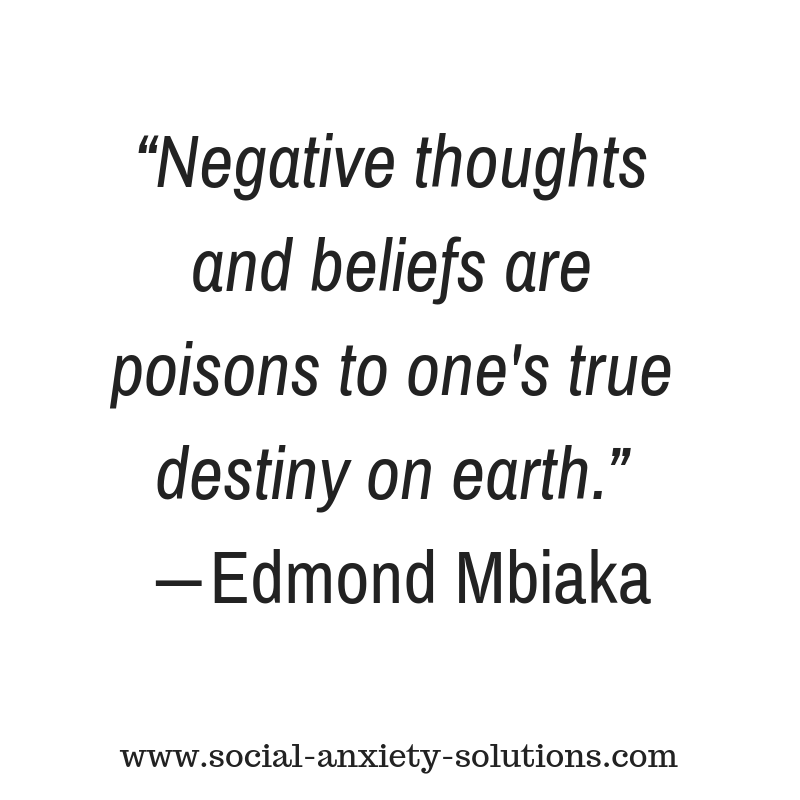 …that are robbing you in the foreground of your conscious life. And until you become aware of these and heal, it’s a pattern that will continue. Plus, I have a couple of exciting announcements. Sebastiaan: Hello, this is Sebastiaan from social-anxiety-solutions.com. I am a social confidence coach and help people to go from social anxiety to social confidence. In this video I’m going to answer a question that was sent in to me via email and I’m pulling it up right now. The question is as follows. Here we go, let me read this from the screen. “My name is John”. John is asking me – “Hey, Seb, how many times do you apply EFT to help rid of the emotional attachment to a belief? A few times a day? Every day? Thanks, John”. John, thanks for your question. It’s not a certain amount of times that you tap on a belief rather how you tap on a belief. By the way, tapping stands for Emotional Freedom Techniques. It’s a tapping technique whereby you tap on specific acupressure points in the body and when you do that while you’re focusing on a particular negative emotion, the negative emotion releases and you let go of it. Presuming you do it in the right way. How are you doing it in the right way? Go to my website and sign up for my free social confidence course. There’s a link under here I’m sure. How do you do that John? Well, it depends on what kind of belief it is. I’d like to distinguish between surface beliefs and deeper ingrained beliefs. Now, the surface belief would be something that has little to support it. A surface belief might be “Social people are superficial” for example. While that might be true it doesn’t necessarily have to be true, but you might have a belief like that. And unless you have strong emotional experiences where you learn that that is the case, it’s a belief that is rather easily changed. In that case you can just tap and say “Social people are superficial; I don’t like superficial people; It’s stupid to be social; I don’t want to be social; People are superficial” etc. Then you can start to bring in some doubt like, “Well, not every single person who is social is also superficial; I know this guy and he’s very social, yet he has a deep and meaningful conversations as well”. The belief will easily start to shift and change. Sometimes you don’t even need to do tapping for that. Now, when we’re talking about a deeply ingrained belief, I’m talking about emotionalized strongly held beliefs. An example might be “I’m not good enough” which is kind of like the common belief pretty much everyone else has. 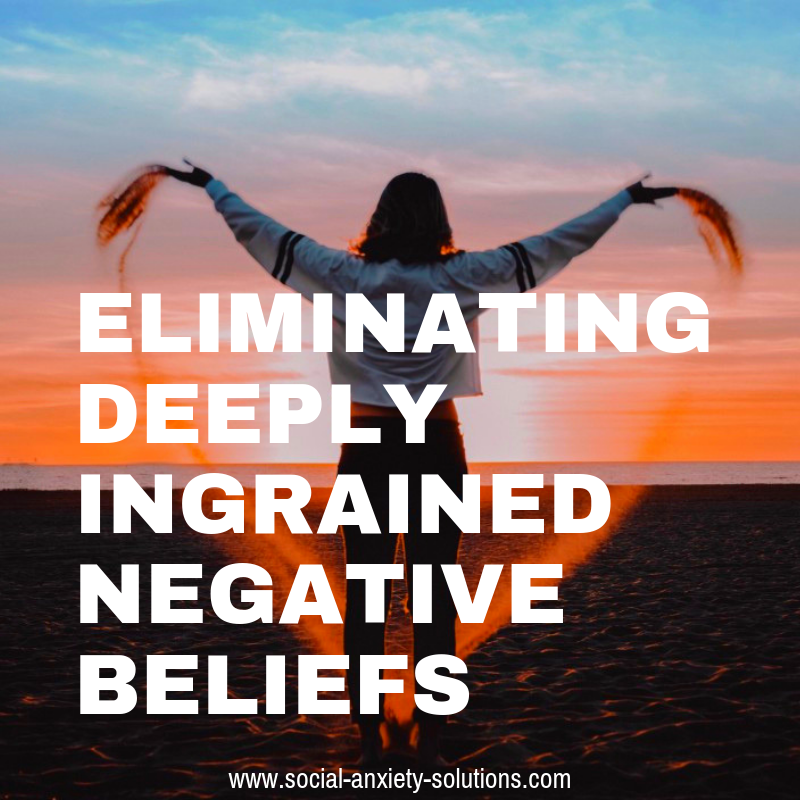 There are variations to that like “I don’t love myself” or “I don’t like myself” or “I’m unlikable” or “People don’t like me” or “There’s something wrong with me” or any of these strongly held beliefs. If you just tap on that, after just a bit of tapping and verbalizing it, it might go a little bit less strong. And that’s why John, if you’re watching this you probably think, “Well, I just need to do it a lot”. Yet, not really because there’s a lot underneath that. If you believe for example that you’re not good enough, you have emotional evidence to support the validity of that. How do you know that that’s true? Well, you feel it to be true. You might logically go, “I know that I’m good enough and I’m a nice guy; I have a good sense of humor; I do well in school” or “I have a good job” or like “I’m nice to people” or whatever, “I have good morals, good ethics, good values”. Whatever. 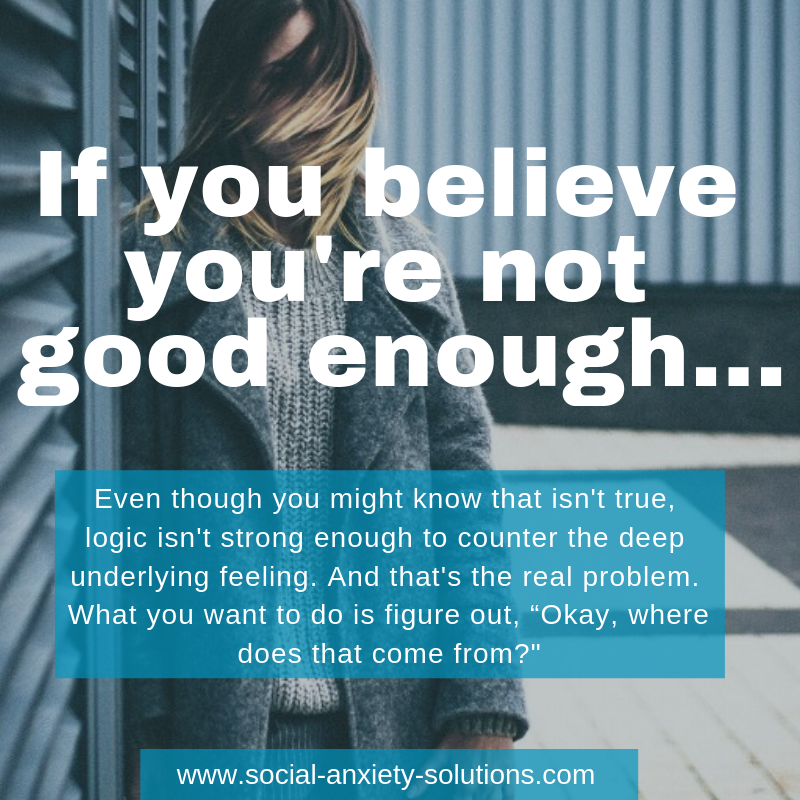 But if you’re emotionally saluting that “Not good enoughness”, that’s when you have a problem because then there’s emotional evidence that backs that up. You might have had critical parents, or you might have been compared to your sister, you didn’t measure up, maybe you were abused in some way. There are many repetitive negative experiences in early childhood where emotions were felt over and over and over that got stuck in your system. That would probably be the foundation of that belief and then maybe you went through life and you had more pieces of evidence, pieces of emotional evidence, traumatic experiences life experiences that were painful where you learned or confirm that indeed you’re not good enough. Maybe you got rejected by your crush or maybe you applied for this school and it was really important to you that you were going to make it in and you didn’t make it in. So, it felt like a big failure. Or maybe you were excluded from school or maybe you went to a different school and you didn’t have any friends. There are a couple of reference experiences that are the evidence that you’re not good enough to actually need to go to these places and that’s what you need to tap on. …imagine that to be a tabletop, the top of a table and there are supporting legs keeping the table up, keeping the table stable. Now when you get rid of the experience where you got rejected by your crush, now the table is a bit more wobbly. It’s still in place but now it doesn’t feel as strong anymore. Then you get rid of the experience where you applied for the school and you didn’t make it in. Well, now the table is even more wobbly. In other words, the belief doesn’t feel as strong anymore. You kind of start to have some wiggle rules, some doubt can come in. And you got rid of some other reference experiences and eventually the table top will fall and then the “I’m not good enough” doesn’t feel true anymore at all. That’s how you deal with a deeply ingrained belief. Now, there’s a lot more to this because this is the simplest explanation, and this is what in many cases works. Sometimes there’s resistance that you need to clear, sometimes you need to have particular insights that help you realize why your psychology is the way that it is and, in a case, you need to do more work or you need to work with someone in order to address a believe like that. So, I hope it’s been helpful. Thanks for your question John. I release videos like this every Thursday. You can subscribe here somewhere. I’m going to be doing something pretty cool but it’s going to take a couple of weeks for me to put it together. Maybe even longer but I’m going to do a social confidence challenge and I just wanted to alert you about it that this is coming. It’s going to be super exciting, it’s going to be the best of all my work and it’s going to be costing you only about nothing. It’s going to be free. All right, it’s going to be super cool, keep an eye out for that. Alright, so, subscribe so you make sure that you’ll be alerted when that happens. Further, I have a few spots left for my social confidence retreat which happens April 18 in Bali, Indonesia which is the fastest and best and most amazing way to overcome your social anxiety. 7 days with me and my best buddy and six others. We’re going to use all of the techniques that I’ve learned in the past 15 years overcoming my own social anxiety, in the past nine and a half years coaching socially anxious clients. Okay, good. Well, that was it for this week. I hope it’s been helpful, and I’ll talk to you soon. Bye for now.